The above SOPs take effect from 26 November 2018. An amendment was determined for the Reasonable Hypothesis SOP No. 67 of 2013 concerning motor neurone disease. This Amendment SOP No. 99 of 2018 takes effect from 21 June 2018, and corrects an error involving a cross-reference to a factor in the SOP. The Authority declares that it does not propose to amend Statement of Principles concerning migraine No. 8 of 2018 by inclusion of a factor relating to exposure to head trauma. The Authority proposes to amend Statement of Principles No. 7 of 2018 concerning migraine by inserting new factors in subsections 9(2a) and 9(4a) concerning head trauma. The Authority does not propose to make Statements of Principles in respect of xerostomia. Note: please see Declaration concerning xerostomia above. The above investigation notices appear in the Government Notices Gazette of 6 November 2018. Are you a carer? Have you received a request from Centrelink asking for details of your income? From 20 September 2018, the Government introduced an income test for Carer Allowance, which is paid by the Department of Human Services (DHS) through Centrelink. As a result, recipients of this payment must now have an income under the income test limit (currently $250,000 for individuals and couples). Recipients of DVA income support payments, such as the Service Pension, Veteran Payment and Age Pension, will automatically meet the new income test requirements. However, DHS has advised that it has already issued letters to Carer Allowance recipients, some of whom may be DVA income support recipients, requesting they complete the Carer Allowance adjusted taxable income details form. If you have received a letter requesting your income details and would like more information, or an extension of time to respond, you can contact Centrelink’s Carers Line or the new Carer Gateway. DVA is working with DHS to address veteran community concerns as a matter of urgency. 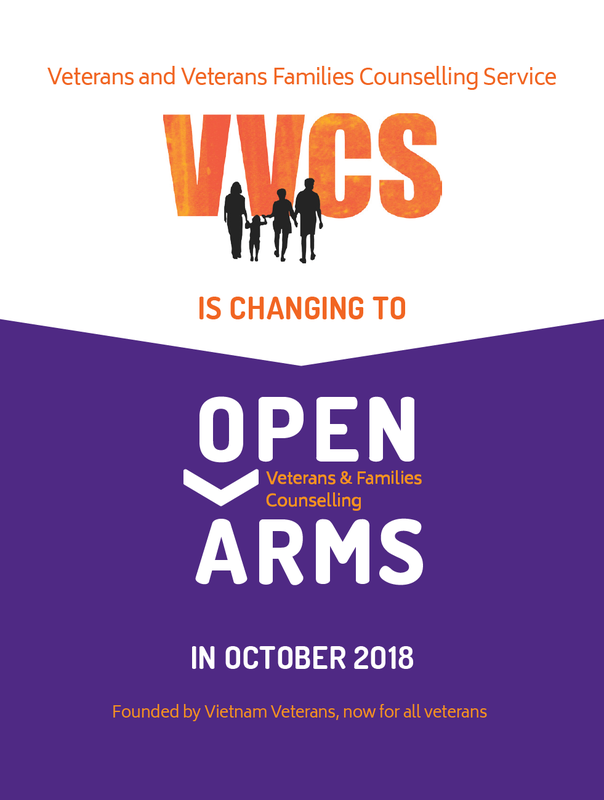 The Veterans and Veterans Families Counselling Service (VVCS) has been relaunched today as Open Arms – Veterans and Families Counselling based on feedback from veterans and veterans’ families. Minister for Veterans’ Affairs Darren Chester said the counselling service, originally founded as the Vietnam Veterans Counselling Service, has been providing essential face to face counselling services to Australian veterans for more than 35 years. “Our Government is putting veterans and their families first and provides more than $11.2 billion each year to deliver the essential services and programs they rely on,” Mr Chester said. “If you have served one full day in the Australian Defence Force you can access free mental health care whether that condition is service related or not. Mr Chester said the rebrand was designed through extensive consultation and feedback from VVCS clients, veterans, staff and Ex-Service Organisations to increase awareness of the service so more veterans and their families know where to go for help if they need it. “This new name and brand will help promote the service, especially to younger veterans and their families, to ensure more veterans and families know where to gain access to the help they need. “Along with face-to-face counselling, the service now offers training programs and peer support networks, relationship retreats, group treatment programs and suicide prevention courses. 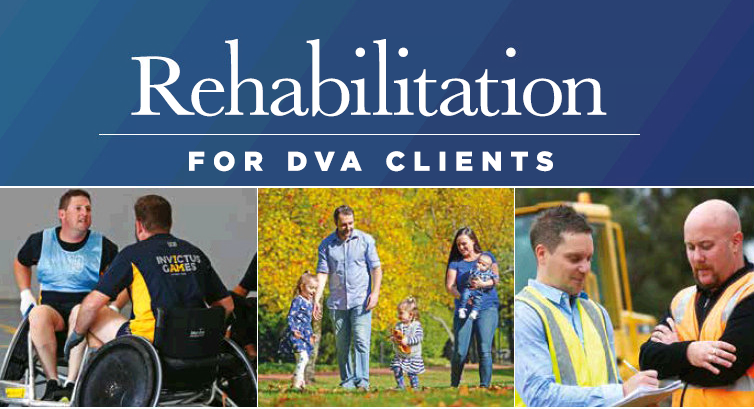 Rehabilitation for DVA Clients is a new publication about rehabilitation for veterans and their families. The booklet provides an overview of the rehabilitation process and some examples of supports and strategies that have helped others make the most of their rehabilitation. It provides a starting point to a range of rehabilitation and complementary services available as part of a DVA rehabilitation plan. At DVA, our rehabilitation approach looks at the veteran’s physical, social and vocational needs to maximise their recovery following injury or illness sustained in the Australian Defence Force. We understand that each person’s journey is personal and unique and that recovery is an ongoing process. Engaging in a rehabilitation program can happen at any time in the recovery journey, straight away, following transition, or later if needed. In DVA rehabilitation, a rehabilitation provider will talk with the veteran to find out what is important to them. A personal plan will be tailored, taking into account individual circumstances and match them with suitable supports and services to meet the veterans’ needs. 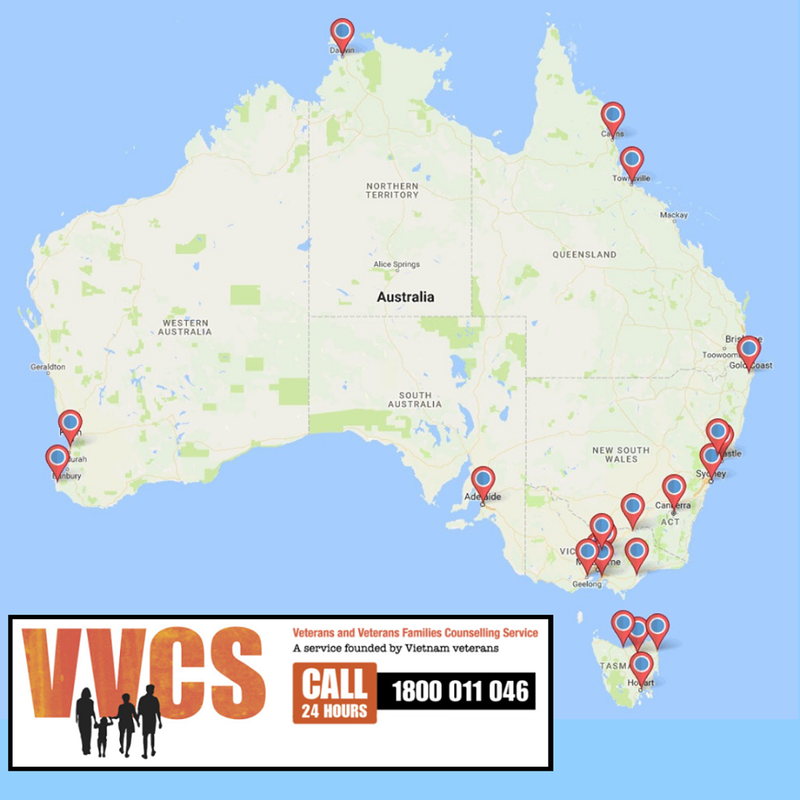 The VVCS Group Programs calendar has been updated with new dates and locations across Australia. Group Programs provide veterans and their families the opportunity to better understand and address mental health conditions such as depression, relationship issues, anxiety and sleeping disorders. The Veterans and Veterans Families Counselling Service known as VVCS, is changing its name. From October 2018 the service will change its name to Open Arms – Veterans and Families Counselling. Although the name is changing they will continue to provide professional, military aware, support to all current and former serving ADF personnel and their family members. To find out more click here or call 1800 011 046. Minister for Veterans' Affairs Darren Chester said this Government is working hard to put veterans' and their families first. "Our Government provides more than $11.2 billion each year to deliver essential services and programs to support 290,000 veterans and their families," Mr Chester said. "The new pension rates will be fully effective from pension payday 11 October 2018 for pension recipients including veterans, their partners, war widows and widowers across Australia." Due to the calculation of pension rates on a daily basis, the first pension paid after the indexation on payday 27 September 2018 will comprise a component of both the old and new rates. Pensions are indexed twice a year in March and September. For a full list of pension rates visit DVA's income support information or call 133 254 or 1800 555 254 (from regional Australia). The above SOPs take effect from 24 September 2018. An amendment was determined for the Reasonable Hypothesis SOP concerning motor neurone disease. This SOP takes effect from 21 June 2018, and was made under s196B(10) of the VEA at the direction of the Specialist Medical Review Council. The above investigation notices appear in the Government Notices Gazette of 4th September 2018.